Beginning in January 1992, I began to make a list of every book I read. At the time, it seemed like it would help me to give recommendations to others (especially when I couldn’t remember what I’d read five books ago). Nineteen years into “the list,” it has proven to be that and so much more. Not only do I pull out my lists when trying to recall something, but the list has become a diary of sorts. I can see what interested me, what author caught my attention. For example, in 1993, I read three novels by Willa Cather. 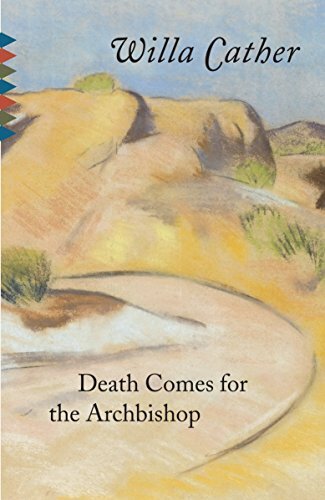 If you’ve never read, Death Comes for the Archbishop – add it to your list for 2011. I can also look at the number of books read in a given year and know exactly why the number was high or low. Take 1995. My son was born in December 1994. So, in 1995 I can see that The English Patient took me three months to read! I must have been reading pages in the middle of the night while feeding him. Admittedly, I don’t recall much of it. Of course, that was also the year I read Operating Instructions: A Journal of My Son’s First Year by Anne Lamott. What’s interesting is that every year after Bob was born, the number goes up. In 1995, I read only 14 books. But, it climbs steadily as he gets on his feet (literally) and by the time, he goes to school – I’m reading 50 books per year. I can see when Harry Potter arrives on the scene and the books people were talking about. What’s really interesting is when I begin graduate school. The number skyrockets! In 2004, I read over 100 books – nearly all of them assigned in one of my classes at Simmons. There are a few I remember reading on the subway – turning pages as fast as I could. Which brings us to the 2010 list. I read 56 books this year. I finished one last night, and unless I read one today, that’s the total. I just looked over the list, and came up with my ten favorites of the year. I’m not separating novels for children and adults – this is what stands out. I hope 2011 brings you good books and safe travels. Happy New Year! This happens sometimes. I’m between books I have to read for school and all of the sudden have an opening to read something that’s been on my list. It can’t be a long novel because these windows of opportunity slam shut the minute I begin teaching a new novel in one of my literature classes at Inly. But I had some time this weekend to read a book I’ve wanted to read for years. A decade to be exact. 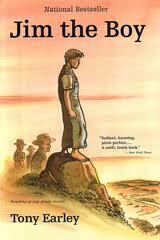 I bought Jim the Boy by Tony Earley when it was published in 2000. It has been sitting on my shelf since my now 15-year-old son was in kindergarten! That’s embarrassing.